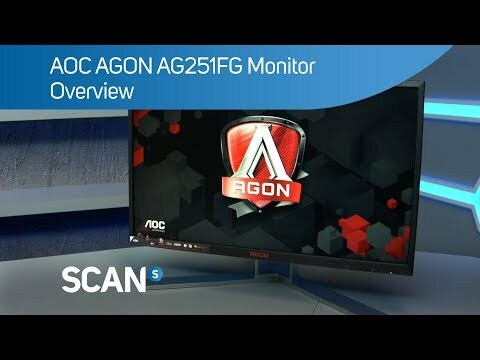 Ahead of the game with 240Hz refresh rate The AOC AGON AG251FG is a sharp 25" 1080p Full HD gaming monitor that provides users with intense on-screen action without tearing, stuttering or motion-blur, thanks to a 240Hz refresh rate, NVIDIA G-Sync and a 1ms response time. AOC Lowblue Light helps to protect your eyes from blue light whilst you game and Shadow Control allows you to adjust the brightness of your games on the fly. Boasting a 1ms GTG response for an enhanced experience. experience a 1ms GTG response Evidently the fastest refresh rate on the market, the AOC AGON AG251FG gaming monitor boasts an astonishing 240Hz refresh rate completely unleashing top end GPUs, bringing unparalleled fluidity to the picture on your screen. With every detail brought sharply into focus and every movement shown with crystal clarity, feel your reactions become one with the action and elevate your game. A pixel response time of 1ms GTG means speed without the smear for an enhanced experience. Fast-moving action and dramatic transitions will be rendered smoothly without the effects of ghosting. ELIMINATE LAG AND GAME SMOOTHLY The AOC AGON AG251FG features NVIDIA®G-SYNC™ technology which delivers the smoothest and most amazing gaming experience. G-SYNC™ cleverly synchronizes the monitor’s refresh rate to the GPU in your NVIDIA-powered PC, eradicating screen tearing and minimizing display stutter and input lag so that scenes appear instantly, while objects look sharper and more vibrant. heighten your gameplay in dark areas Bring the battle out of the shadows and into the light with AOC's innovative Shadow Control. With this feature you can instantly brighten dark areas or sink them back into blackness on the fly, without affecting the rest of the display. play comfortably. play professionally. The AOC AGON AG251FG gaming monitor helps to prevent eye damage and troublesome eyestrain, with AOC Lowblue Light which protects your eyes from harmful blue light during long sessions online. The Lowbue Light feature reduces the harmful wavelengths emitted without sacrificing colour composition, setting the experience free from the worry of eye damage. 24.5" AOC AGON AG251FG 240Hz NVIDIA G-Sync FHD Gaming Monitor, TN, 1920x1080, 1ms, Adjustable, VESA, Black/Red, DP/HDMI is rated 5.0 out of 5 by 1.